The Spanish champions romped into the semifinals with a 4-0 aggregate win, having beaten the Red Devils 1-0 at Old Trafford in the first leg. This was the first time the Blaugrana had made it into the semi-finals since four seasons ago and the Argentine talisman was expectedly ecstatic as his team's performance in the post-match press conference. Lionel Messi scored a sensational solo goal from outside the box to put Barca ahead at the Nou Camp. Nutmegging a hapless Fred, the mercurial magician curled the ball past David de Gea to record his first ever quarterfinal goal, having played UCL quarterfinals. Barcelona doubled their advantage in the 20th minute, this time de Gea letting a mid-range shot from Messi slip under his body into the goal. The dominating display put on by the Blaugrana was capped with a sensational, signature long ranger from Philippe Coutinho in the 61st minute. A clueless Manchester United was shown a masterclass in Champions League football by the leaders of La Liga. 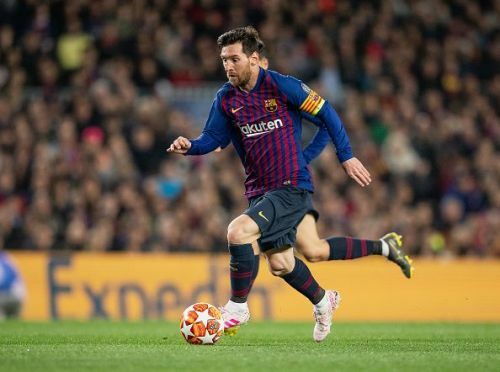 During the post-match presser, Lionel Messi rang the praises of his team's mentality in the game, but also warned his teammates that they should be faster off the blocks to progress further in the competition. The Barcelona captain also commented on their potential rivals in the semi-finals, the victors of today's Liverpool-Porto second leg clash. Barcelona is currently top of the table in the Spanish La Liga with a lead of 9 points over their nearest rivals Atletico Madrid. Next up, they face Real Sociedad at home on Sunday. On 7th May, the UEFA Champions League resumes with the semi-finals where the Blaugrana will face the winners of today's Liverpool vs Porto tie.